The device screens for drugs of abuse by analysing chemicals (known as metabolites) contained in the minute traces of sweat found in a fingerprint. Metabolites are produced by the body as a result of normal metabolic processes and can be analysed to identify the substances a person has ingested, inhaled or injected. The presence of drug metabolites in someone’s fingerprint sweat indicates drug use by that individual. Our drug screening technique is non-invasive and does not require specialized sample collection or biohazard precautions. The device is handheld and ideal for use in almost any location at any time. It provides results in less than 10 minutes and screens for multiple drugs of abuse in one cost-effective disposable test. The device is easy to use, requiring no special training. 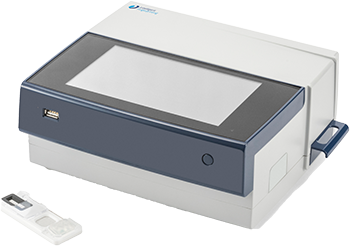 The fingerprint sample is obtained on a collection cartridge, the screening device is touchscreen-operated and fully automated. Results are presented within ten minutes giving a simple pass/fail against pre-determined drug screening cut-off levels. The device automatically measures drug concentration against these cut-offs without the need for the operator to read test strip results or similar. Which drugs will it detect? Initially, the device will screen for five commonly abused groups of drugs: Amphetamines, Benzodiazepines, Cannabis, Cocaine and Opiates. The device screens for multiple drugs of abuse in less than 10 minutes. Our technique has been tested to ensure accuracy and precision. The test can be calibrated to different cut-off levels, which means the pass/fail criteria can be altered to different drug levels according to customer requirements. What is the window of detection? Our device screens for drugs by analysing fingerprint sweat which gives an indication of an individual’s recent drug use habits. Is cross contamination a concern? The technique detects drug metabolites rather than the drugs themselves, so a positive result indicates that the person being screened has taken the drug and not simply touched a surface contaminated with the parent drug. The device will be available in 2015 for selected applications. Pricing of the device and the sample collection cartridges will depend on customer requirements and will vary depending upon the number of tests being carried out. The overall cost of carrying out a test will compare favorably with existing drug screens of similar complexity. Feel free to contact us with specific pricing questions. What size of particle is this measuring? How many picograms of drug metabolite are needed for a valid sample? This varies between each drug group depending on the cut-off level. It is usually in the 10 to 100 picogram range. We are currently collating technical and design history files prior to seeking FDA approval for the device. How else could the device be used? Our fingerprint-based diagnostic technique has potential for use in many other areas such as healthcare, security and border control. Research and development is ongoing in these areas. This varies between each drug group depending on the cut-off level. It is usually in the 10 to 100 pg range. Will liquid ingested adulterants affect the test sample? Approximate analysis time per drug? This will depend on how many drugs we include in a single analysis strip. It will be a maximum of 10 minutes (if five drugs in a single strip) down to less than 5 (if only 1 or 2 tests per strip). What does Forensic Use Only or FUO mean? Please contact Intelligent Fingerprinting™ for any technical inquiries that could not be answered with the frequently asked questions.